I’ve been away for a few days messing around with filming video reviews for the site, it’s going to take a bit of practice and a crew would be nice, so if any of you want to get involved with videoing some cars then let me know. The most overused word to describe a VW Golf (or Rabbit for you Americans visiting the site) is benchmark. Yes I suppose it is in many ways, the Golf has been with us since 1974 and back then VW had been at the forefront of the Hatchback segment, the Golf lost it’s way in the late 90’s, it was a fat lumpen thing. Everything changed in 2003 when the mark 5 was released, a whole new car came out and everyone fell in love with the new Golf. But there were some files in the ointment, build quality wasn’t what it should have been and there were some electrical issues, but VW overcame all that untarnished, it still has that classy and classless appeal, every other car brand wishes they had a Golf in the line up, a car that you’re happy with whether you’re a crazy petrol head or a tree hugging eco-mentalist. 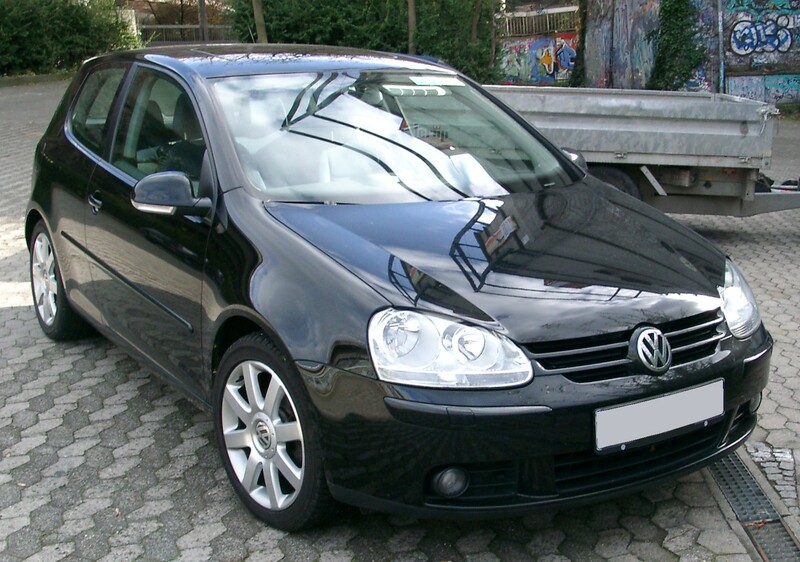 From the outside the 2008 Golf still looks sharp and tough, it sits nicely on the comfortline alloys, they give it a solid look, the metallic gray paintwork is in top class condition. The boot space is 350ltrs but it looks much bigger as the hatch opening is almost square, there is a bit of a lip into the boot but nothing worse than any other hatch of its size. In the back seat there’s loads of leg and head room, the rear seat folds near flat and does 60/40 split, there’s also an armrest in the middle that has a second opening for long loads to poke through. The cabin fit and finish is far superior to the first of these models, everything has a long lasting feel to it, there’s a reassuring thud from the doors as you close them. There are loads of toys to play with, the stereo for instance, it has CD and MP3 plus an iPod, USB and AUX connector, my Creative Zen worked fine from the steering wheel mounted controls. There’s also auto dimming rear view mirror, auto lights and a decent trip computer and air con. The driver seat is a bit hard for my liking, the only real problem I can point out is the lack of an arm rest in the centre, it is rather annoying on a long drive, however you can order it from the dealer as an option, and you can even get it on Amazon. The 1.9Tdi 105bhp diesel engine in the Golf is noisy when you start it from cold, but they are all like that, once a bit of temperature get into the engine it soon quiets down. 105bhp doesn’t sound a lot but when the turbo cuts in there’s more than enough power to get you where you want to go, but due to the lack of high revs the 0-100kph is 11.3 seconds, so all the power comes in one great big lump and then you have to change gear. It’s efficient though, 57mpg combined is the official figure but I reckon if you drove like a hippy you’d get more than that. On the road the firm ride is good over the bumps but the hard seat gets uncomfortable after a while. On the motorway the cabin is very quiet and a pleasant place to be, at 120kph the engine is barely audible and there’s cruise control too, however I think it could do with a 6th gear. When you get onto the back roads, or even a round about you will find a lot of under steer, it’s dramatic under steer too. The traction control light seems to come on every time you point the nose of the car at a corner which kills the fun, when you drive normally you won’t notice it so much but if you push the Golf a bit it will become a pain. Although VW seem to have solved a lot of the problems there are still some left. The Golf is still a great car, there are loads to like, the big boot, great MPG, low road tax (€156 per year), the classless but stylish looks, equipment levels and the solid feel. But the under steer and the hard seats rather spoils the otherwise great package for me, when it arrived on the market in 2004 the Golf was the best hatch you could buy, but everyone else has caught up on the mark 5. As a complete package the Golf still wins against all comers but there’s great alternatives out there, have a look at the Seat Leon, Renault Megane and Audi A3 for a start. Chances are you’ll read this review and still go buy a Golf, the reason is simple, it’s still the best of the bunch. The car I drove is immaculate and available for test drive in Portlaoise Kia (but not for long I expect), it had just come into stock so there’s no pictures on it’s Carzone page but I’m sure they will be along soon.